MERCEDES-AMG has returned to where it all began with a monster four-door sports sedan it hopes will steal sales from the BMW M6 Gran Coupe, Porsche Panamera and Audi RS7. The AMG GT 4-Door Coupe, though, is a far cry from the first modified Mercedes, a 300SEL 6.8-litre V8 that won its class in the 1971 Spa 24-Hours. This is the first four-door developed entirely in-house rather than a rebadged and tweaked Mercedes-Benz production car. 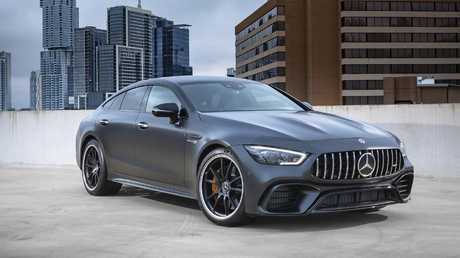 The new Mercedes-Benz AMG GT63 4-Door offers blistering performance in a stylish package. 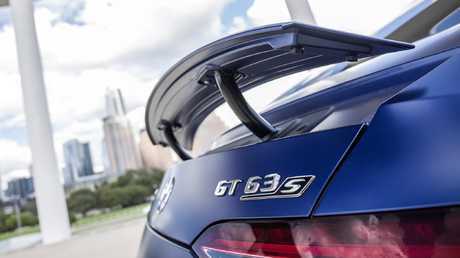 Two versions will make it to Australia mid-next year: the GT 63S with 4.0-litre V8 twin-turbo and GT 53 with a new 3.0-litre six-cylinder twin-turbo. The latter produces 320kW and 520Nm with the help of a 48V boost starter set-up that kicks in an extra 16kW. The 4-Door replaces the CLS. 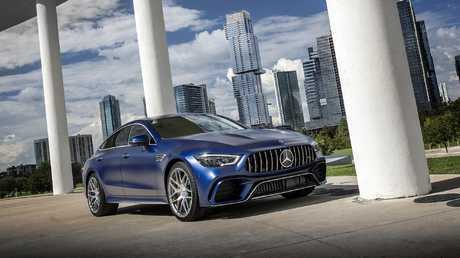 It is intended to be a sedan version of the brawny GT Coupe but it has more in common with the Mercedes E-Class than the race-bred sports coupe. Remove the slick body and you will find the rear-wheel drive platform of the E-Class with the conventional front-mounted engine and transmission. The GT Coupe's transaxle layout, incorporating the gearbox in the rear differential for better weight distribution, was deemed too complex to translate to the four-door - and was too wide (by 136mm at the rear) to squeeze under the narrower sedan bodywork. 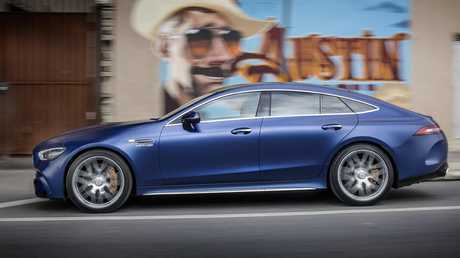 There are benefits, however - the 4-Door gains the latest Mercedes-AMG rear suspension mods including rear-axle steering. The 4-Door adds practicality to the AMG GT range. In this set-up, the rear wheels steer opposite to the front at up to 100km/h to reduce the turning circle of the five-metre long car and then turn in the same direction as the fronts for easier high-speed lane changing. We tried the 4-Door on the Circuit Of the Americas in Austin, Texas - one of the best motor racing tracks you will find, fast, flowing and dangerous if anything goes wrong. Moments after yet another 255km/h run down the straight and punishing the six-piston, 360mm composite brakes of the 63 S to enter Turn One, I following a driver who gets it crossed up as he exits. Turns One to Five flow in a series of downhill esses like the rollercoaster coming down Mt Panorama - get it wrong at the top and it only gets worse as you try to regain control. From my position, I can see AMG's electronic stability control saving him potentially from five high-speed loses in succession. The Mercedes-Benz AMG GT63 4-Door has the brand’s latest dual-screen interior layout. The evidence - graphic and re-assuring at the same time - is the small puff of brake dust from each wheel as the on-board computers wrestle the car back under control in micro-seconds without the driver even realising what's happening. It would be reasonable to expect the rear end to get light through the constantly changing fourth-gear sweepers but it stays pinned the whole time. The V8 (470kW/900Nm) is easily up to the circuit task but the nine-speed auto transmission reminds me that this is still more of a road car than a track day special. Smooth and quick on the up changes, the transmission is hesitant to accept quick, multiple down shifts when flicking the paddle-shifters back from fifth to second for tight corners. The AMG GT 4-Door shares the same platform as the E-Class. 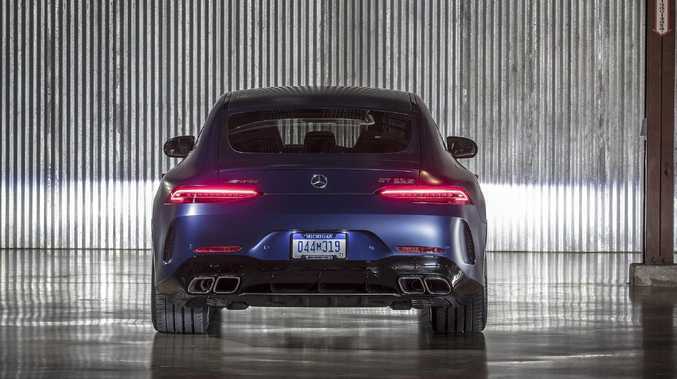 On road, it performs seamlessly but it's an example of the compromise facing the engineers when trying to graft AMG's track-focused performance on to a family-friendly sedan. The interior is familiar, with the dash dominated by a digital wide-screen that's standard on the 63 and optional on the 53. The 53 gets a 17.8cm multifunction display but can be optioned with the 31.2cm display from the V8. Black Nappa leather dominates the interior and there is an Alcantara-wrapped steering wheel. Rear seating options include a bench for three, two seats with attached leather console and two individual seats with LCD control panel between them. Eight switches in the centre console around the gear selector operate the drive modes, traction control and exhaust modes. Mercedes-Benz Australia hasn't confirmed pricing for the 53 or 63 S - there will be a premium over the equivalent E-Class. The 4-Door features active aerodynamics.